Have you ever wondered what it would have been like to be an explorer? Ever dreamed of visiting Antarctica? 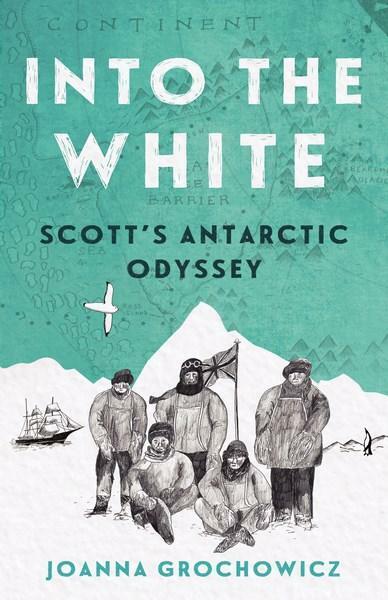 You can experience both by reading Into the White: Scott's Antarctic Odyssey. But this is no pleasure trip, and the life of an explorer in one of the world's most extreme climates is not easy. If you know the fate of Captain Robert Falcon Scott, then the hardship of the journey, and the end of the story, will come as no surprise. Scott's experience at sea began as a thirteen year old boy, and his life ended in a tent in the middle of a blizzard in Antarctica. Knowing all this doesn't spoil the book. It does set the scene for a tense adventure. Reading Into the White you'll be immersed in Scott's world 'from heroic beginning to tragic end,' starting in December 1910 as the ship the Terra Nova edges ever closer to the world's frozen, southern-most point. Joanna Grochowicz has used Scott's diaries to write Into the White in narrative style from the perspective of Scott and his colleagues. You'll experience life on board ship with all its difficulties balancing on the shifting decks, sharing quarters with dogs and ponies, watching passing whales, missing family, hit by storms and coping with gut-wrenching seasickness. You'll also experience living on and travelling across the ice: being surrounded by blinding whiteness, fishing, playing football, seeing the beauty of the aurora lights, and dealing with appalling weather conditions and hazardous health conditions like frostbite as the expedition struggles to reach the south pole. And the tragedy of losing mates both human and animal. The book contains more than twenty photos by Herbert Ponting who was the expedition photographer. Among them, images of the men's rations and living quarters, one of the ponies that hauled supplies, a sledge dog, reindeer skin boots designed to be both warm and functional, and the men who set out to make history. All are a stark reminder of the reality of Scott's story. A short epilogue and appendices are included, but it's the way Into the White ends, with Scott's final diary entry and imagined final moments, that make it most poignant.